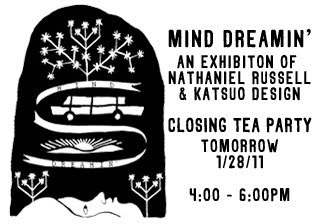 The Mind Dreamin' show with Nat Russell & Katsuo Design is just about to end. This Friday as closing of the show, we'd like to invite you to join us tea party here at the POPgallery. Those of you who missed opening night, here is the last chance to see great works. Also, all the artworks will be 20% off, on this day ONLY!